Why the excitement? 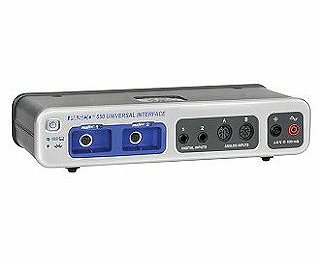 Well, the 550 Universal Interface is fast, powerful and versatile! But there’s so much more to the story – we took many of the great features of our 850 Universal Interface, and put them into a smaller, yet still robust, little box! The 550’s two digital inputs are compatible with all ScienceWorkshop digital sensors, and with timing devices and photogates. It also includes two Analog ports, which offer 1MHz sampling and .12 mV resolution with an analog voltage sensor, something our competitors just can’t match. There’s still more to the 550 Universal Interface. Beyond having USB 2.0 connectivity, the 550 also features wireless connectivity and compatibility with PASCO’s SPARKvue Software. Powerful wireless sensor interface equips labs with high-speed data collection, signal generation and power supply, use with PASCO software for oscilloscope and FFT displays, timers, and more. This is the interface with the measurement capabilities for any physics experiment your lab needs.